This is your last week to RSVP for the CBS Seder! Have you made your reservations yet? MITZVAH DAY WAS A SUCCESS!! This was such an important day as you were able to help those in so many ways. The end result is, you made a difference in the world. Kol Hakavod! Click Here to see the photo gallery from Mitzvah Day. 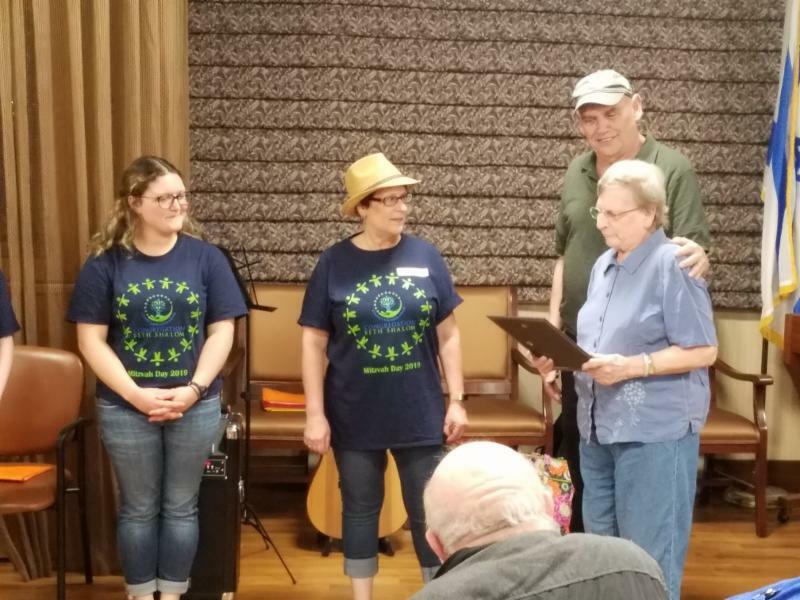 In this photo at Menorah Manor, resident Harriet Chesler (mother of Karen Tashman) presents a Certificate of Appreciation to CBS. · Give a gift so someone else can attend: Consider giving a donation to CBS during this season to help ensure that all who need a Seder will have a seat at our table. · Open your home to those who don't have a Seder to attend: Consider inviting your fellow congregants who don't have a place to enjoy Seder. 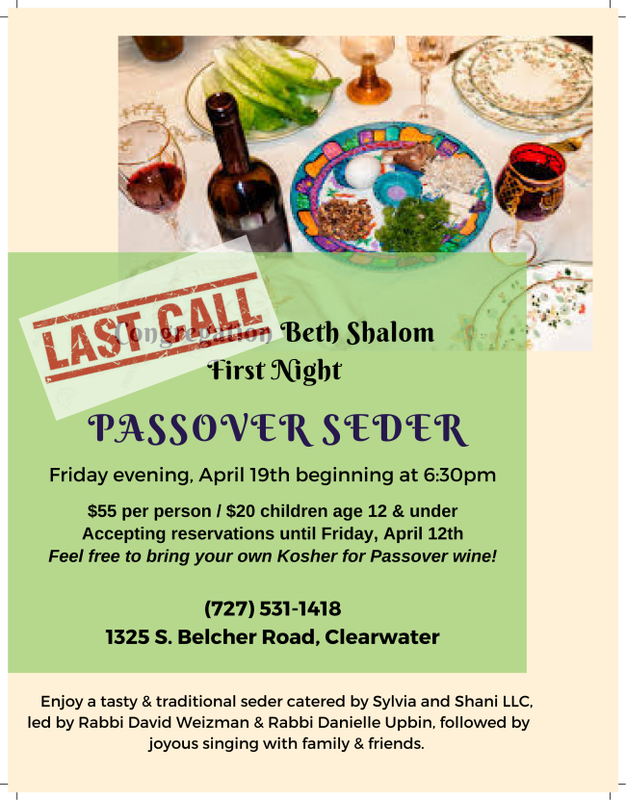 Please contact the CBS office by Thursday, April 18th , if you have room at your table or if you are looking for a home where you can celebrate Seder. The office will do their best to match those who have offered with those who have requested a seat. Please note: CBS cannot guarantee that there will be availability or a match found. 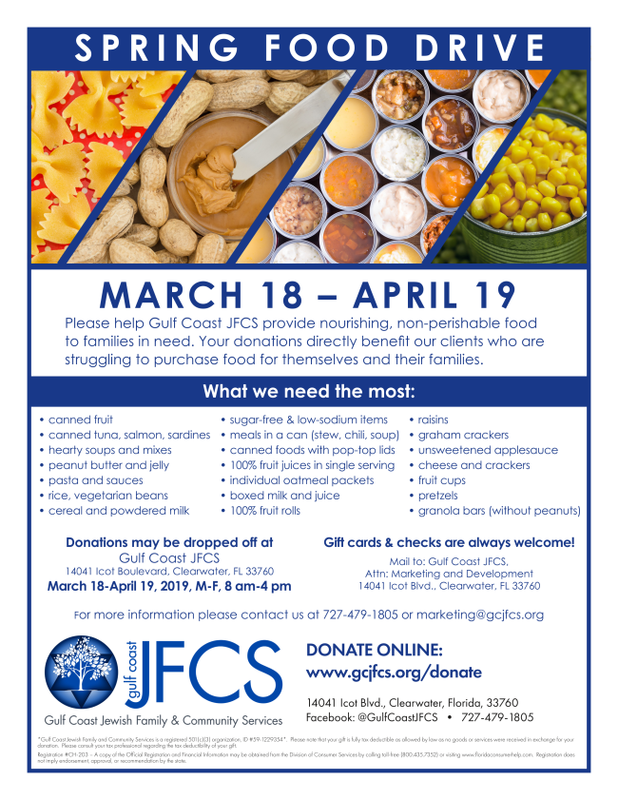 · Food Drive: Feeding the hungry is one of the mitzvot of Passover. Please fill a bag and drop it off here at CBS for local food pantry donation no later than Friday morning, April 19th. Passover is only a week away! If you would like to join us at CBS for the First Night Seder, we would love to break matzah with you! 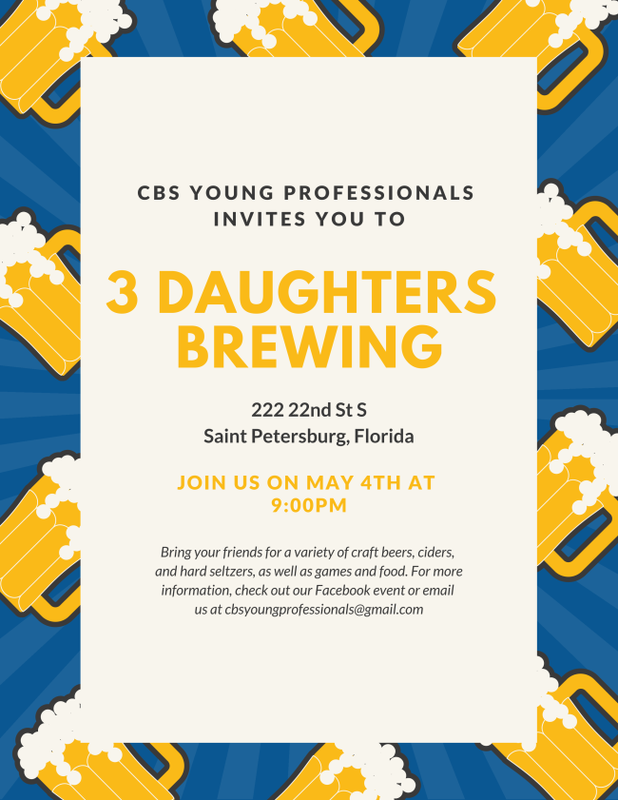 Make your reservations by Friday, April 12th by calling the CBS office. We try to make it easy for you by accepting credit cards over the phone. Looking forward to another joyous holiday celebrated with friends and family! Click Here to download your Sale of Hametz form. 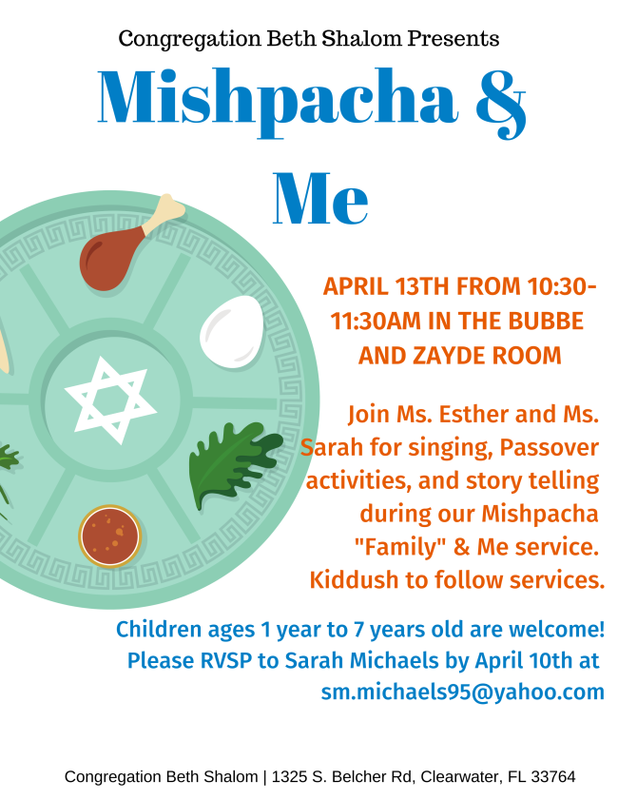 Simcha Shabbat celebrating April birthdays & anniversaries! 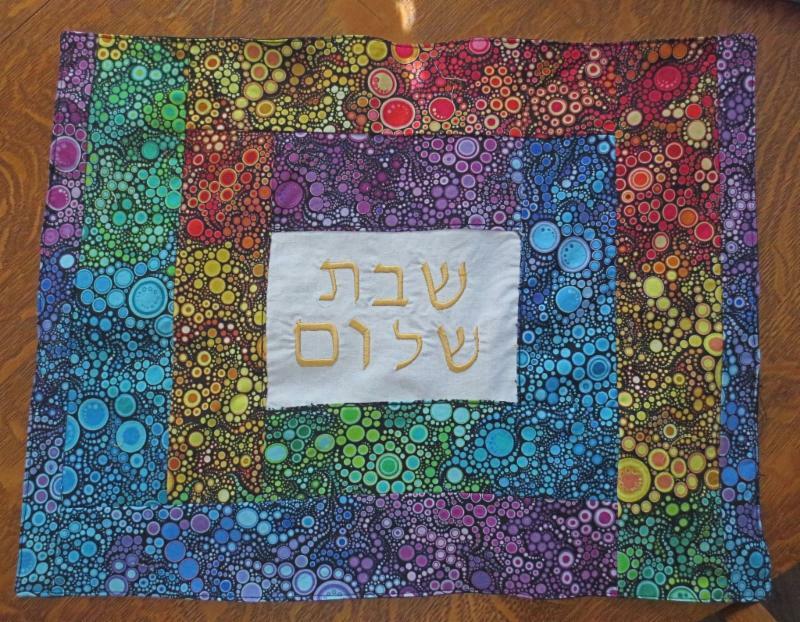 Prayer in Motion with Rabbi Danielle Upbin 9:30am CLICK HERE for more details. Lunch & Learn: 'Preparing for Passover' led by Rabbis Weizman & Upbin following services. 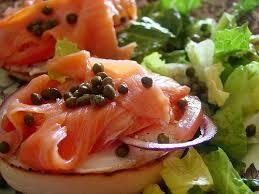 First Night Seder at CBS, 6:30pm. Catering by Sylvia & Shani. The Prophet Elijah, coming soon to a seder near you! $55 adults, $20 children (age 12 and under). Call the CBS office by Friday, April 12th, to make your reservations. 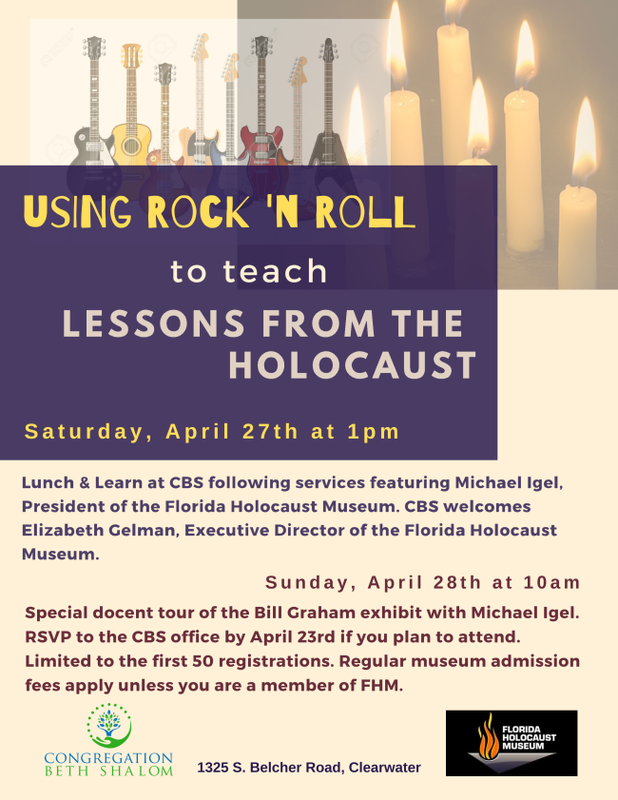 'Using Rock 'n Roll to Teach Lessons from the Holocaust' - Lunch & Learn after Shabbat services, with guest speaker, Michael Igel, Florida Holocaust Museum President. 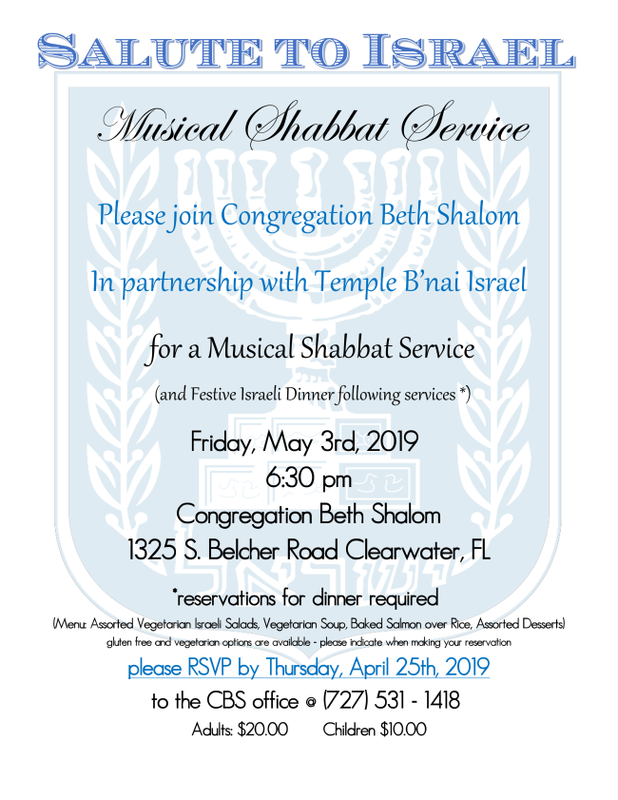 Salute to Israel Musical Shabbat & Dinner A combined event with TBI & CBS (at CBS). 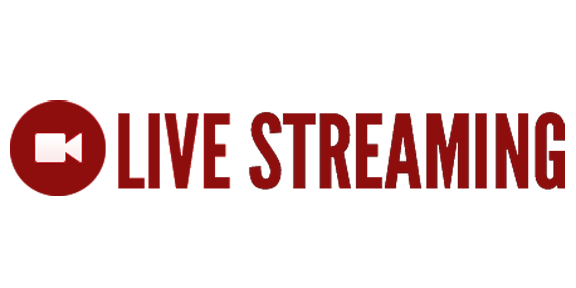 6:30pm RSVP to the CBS office. $20/adult, $10/children age 12 & under. Taking reservations until April 25. CBS Celebrates World Wide Wrap - Come learn how to wrap your tefillin and enjoy a Brotherhood sponsored breakfast afterwards. 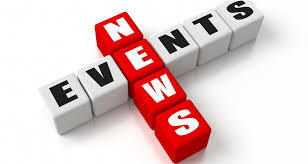 Lag B'Omer at CBS - More info to come! 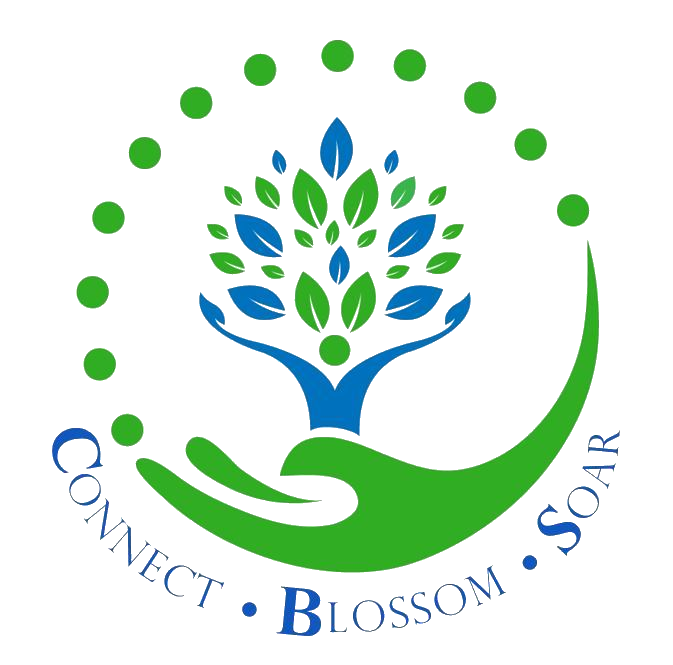 This year, The Sonya Miller Women of Distinction awards will be presented on Sunday, May 5th at Suncoast Empath Health - The Gathering Place beginning with a reception at 1:30pm. The theme is a Tribute to the Women of the IDF. Contact the Federation for tribute opportunities for this event. CBS will continue to update this information as the date approaches.